Toonia (www.toonia.com) is an app studio driven by 6 creative, passionate people who have been making apps for kids since 2012. And not just “any old apps”. We do our best to produce healthy, fun apps that are simultaneously beautiful, creative, and educational. A great deal of our attention goes into creating an all around distinctive experience, from illustration quality and color selection to proper sound creation. Toonia apps are designed to be calming while at same time positively stimulate kids’ imagination. Our mission has always been to give children something they would love to play with, something that encourages them to think creatively and teaches them skills that will become useful later in their lives. When we first started Toonia, we were kids ourselves. Through the years we’ve grown up, and some of us even became parents: today there are three little Toonia boys on the team! At first, we could only imagine how it must feel to love someone so much, and now we know how it feels. 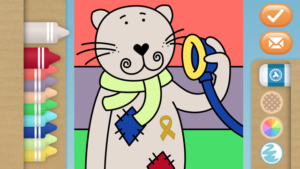 That’s why it was so easy to say “yes” to ACCO’s proposal to include Cozy the Port-a-Cat in our Colorbook app. We are humbled and honored to have been given the opportunity to become a part of something so noble. Making Cozy part of the Toonia Colorbook is our way of helping brighten the days that littlest cancer warriors have to spend resting. Hopefully our apps, with the help of Cozy, will help distract children from the discomfort and boredom of days and months spent undergoing treatment by allowing them to create their own carefree imaginary world, where worry, pain, and other daily companions that childhood cancer warriors must live with are not invited. We are so pleased to be part of the ACCO’s ongoing efforts to provide assistance and support to children facing childhood cancer and their families. If you love Cozy and support the ACCO and its mission to continue providing the highest quality support to cancer’s youngest warriors, you can show your appreciation via the app itself. When in the Toonia Colorbook, go to the Parental Section where you will find a link to a Donation website. Follow it and make a donation of your choice to ACCO. Every dollar helps!